Artem Gorbunov Design Bureau developed the interface for the fourth version of The Bat! mail client. Millions of people rely on mail clients every day. Mail should be intuitive and accessible to all. The new Bat is stripped, reinvented and wrapped up in the Vista skin. The Bat! stores message history for every correspondent, both people and companies, under a common domain name. 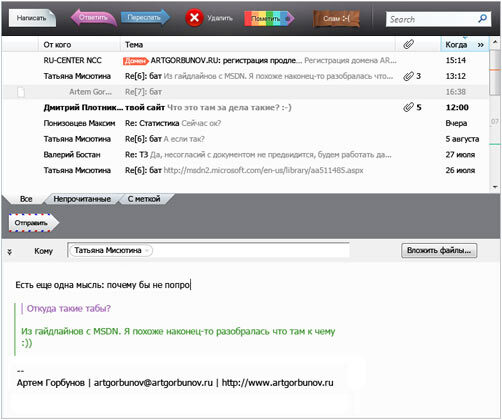 Users access the entire message history with a single click. Reply draft goes under the original message in the inbox and gets edited in the preview window. Drafts go both to the inbox and the drafts folder. No more saving documents. All drafts are saved automatically, with unlimited undo. Last cursor position is remembered when navigating around the message list. Finding messages while typing the request is something Windows users have been waiting for a very long time. The results are instantly filtered by folders, tags and message attributes. 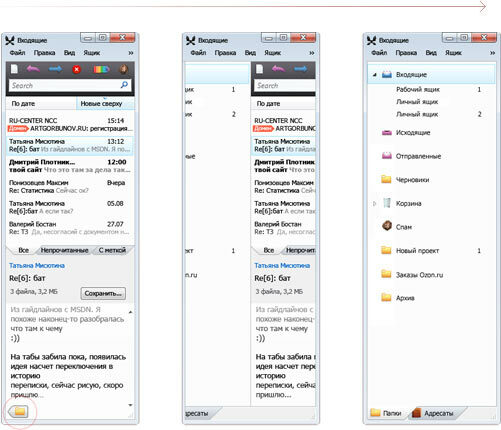 When resized, the interface adapts so that even the minimally-sized window remains functional. We thank Sergey Demchenko for trusting us with this.